It’s about to get controversial up in the Break Room because I’m going to make a confession. Not an earth-shattering one, but one nonetheless. I never get controversial. Well, I have before, but it is something that I try to avoid. I don’t like when people throw chairs around, you know? The controversy surrounds schools, education, diversity, socioeconomic status, uppity people and…the PTA. Or is it PTO? I can’t keep up. And I didn’t bring it up. Sounds like an exciting book, right? 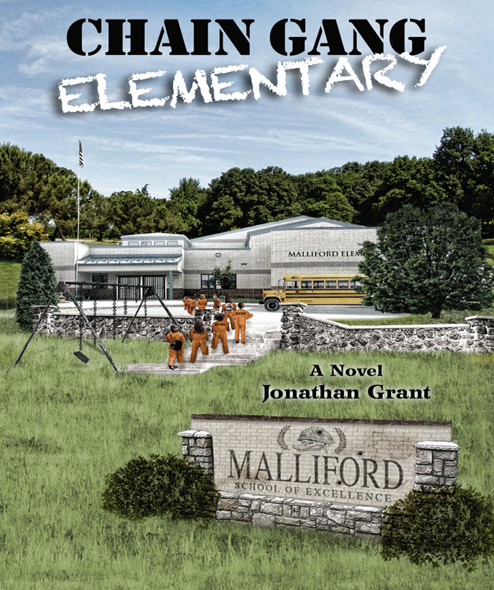 Chain Gang Elementary held my attention and convicted me over and over again. Mr. Grant delivered this book to me right during the time we were considering moving out of our house. We had a few reasons we wanted to move, but one of them was to get into a different school district. The school we were at was a great school. I mean, the teachers were dedicated, the principal was caring and my son felt very comfortable there. But, in terms of state records, it wasn’t a “high-achieving” school. For reasons tied to parent involvement, homework was not given out unless parents requested it. Textbooks were never sent home, at least not in the time we were there. (My son is in the second grade.) I could count the number of parent volunteers on two hands. Maybe even one. I know this doesn’t mean that the parents didn’t care. There are multiple reasons why parents cannot get involved in the school, but at PTA meetings, there were a handful of parents and a bunch of crickets. My son is now in a school where there are TONS of parents involved. There are so many volunteers that you have to fill out applications like you are applying for a job and get a badge made. There is a wall full of badges that the volunteers grab when they are serving, as well as a computer for them to log into when they arrive and depart from the school. And it makes me sad that I’m not at the other school where the volunteers are REALLY needed. I know I can still go back there to volunteer, but will I? Do I have the time to dedicate there with all of the other stuff I do every day? Why didn’t we stay at the other school? The one that wasn’t as high-achieving? If parents that can volunteer and can help out all leave, then who is there to help? Why didn’t I want to stay? Why did we go? Why didn’t we just move into another house in the same district? Could I have done anything to help the situation if I had stayed? Does “high-achieving” school mean anything, if all the school does is teach to a test? Does a school’s grade on websites like www.greatschools.com even matter? School decisions make my head spin and we haven’t even touched on private schools, charter schools, homeschooling, private schools combined with homeschools and on and on and on. So, yeah, the book was great on lots of levels. It was entertaining, it was convicting, it was controversial, it made me question things, it made me ticked off at women who flirt with married men, it made me ticked off at married men who flirt with women (married or not), it made me laugh, it made me feel sad, it made me feel happy, it made me question standardized tests (which is named the “Standard Hightower Intellachievement Test” in his book for the acronym it provides), it made me want to stay on top of things my kids learn in school and it made me want to watch my back at PTA meetings. You will want to read it for yourself. Lucky for you, the e-book is “Chain Gangnam Style” because it is half-price. You can buy it HERE for only $2.99! That’s crazy cheap! You can also use the Rafflecopter form below to possibly win one of TEN copies of the book. Mr. Grant is willing to give away 10 books and will mail it to the winners for free. Mr. Grant lives in Atlanta with his wife and two kids. He was a former PTA president himself. You can find him on Twitter here. He writes a blog called Chain Gang Elementary that includes information about his book and other things he finds fascinating. He is also the author of the book Brambleman and is working on a fourth book now called The Unhappy History of Higgstown, Missouri (with zombies! ).